The Consumer Electronics Show in Las Vegas -- a forward-looking showcase of a future filled with wallpaper TVs, glass-paneled speaker systems, and unwieldy triple-display laptops -- isn't exactly a den of practicality for most consumers. It's meant to show off the coolest of cool and concepts that you'll see toned-down versions of at retail stores in a couple years. This brings us to Kingston's announcement of the world's largest flash drive, pictured above. 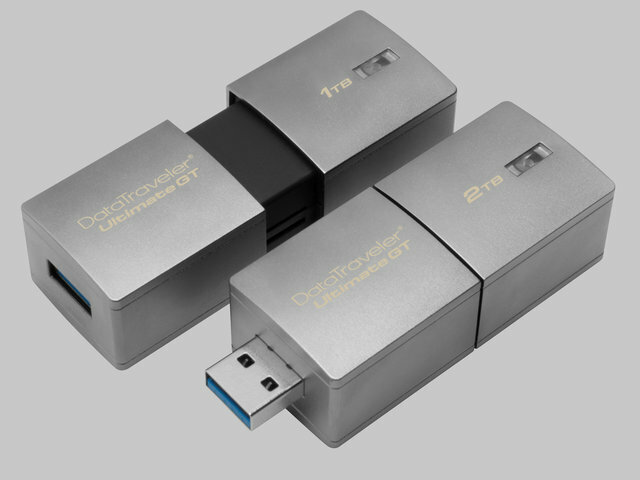 It's called the Kingston DataTraveler Ultimate GT, and it's a monster. Capable of holding either 1TB or 2TB of data depending on your model, this flash drive looks like a tank, is held in a zinc-alloy metal casing, and is capable of holding up to 1792 compressed .MP4 movies if you get the 2TB-capacity model, per its press release. It is the world's highest capacity flash drive until next year, when Kingston will inevitably releases a 2,000 TB model at a future CES and breaks the Internet doing so. Until then, marvel at its boxy sheen, its cold calculus, the allure of storing all the MP3s -- yes, all 531,344 of those songs you want to hold onto forever, even in the age of Spotify -- and the security you will feel when you die, and the people surrounding you in that moment have to pry this small hunk of metal from your cold, dead fingers. You better hold onto it that long, because this flash drive will most definitely cost you about as much money as you can spend on a new computer with a 1TB hard drive. You can find its lesser predecessor, the Kingston HyperX Predator 1TB, retailing for $1,200. One key drawback to Kingston's announcement: this new drive runs on USB 3.0 technology, not the newer, faster, better USB-C. If you really want the fastest, top-of-line flash drive you can possibly buy, we'd suggest waiting a while longer, and availing yourself of a more affordably priced portable hard drive or cloud storage.